Our library is filled with staff and students ready to get their fill of treats for Halloween. Luckily no tricks, the joy of living in a fairly rural and polite region of the country. Earlier today I was at the administration building for a meeting and the children from the child care center came through. The halls were filled with laughter and talk, something unusual for a more serious and business-like building. There were dinosaurs, Iron Men, Spider Men, princesses, she-devils, chickens, construction workers and the like. There were rushes on candy and a lot of smiling faces. Everyone looks forward to their Halloween visit. I was glad to be there. I worked at a somewhat rural community college library as a reference librarian, and there was a period of about three years where the questions on October 31st took a decidedly macabre turn. I think it may have been the same group of young men trying to overset the librarians. Having grown up with three exuberant brothers and other prankster male relatives, I could handle that stuff without flinching. The questions weren’t that weird, but definitely a little off the usual research questions. “Did Mary Shelley do weird stuff with cats?” and the history of the electric chair were two of them as I recall. Our library celebrates this holiday very creatively. We use it as a fundraiser for our social events. It’s always been fun and creative. This year we had a department vs. department decorating contest. 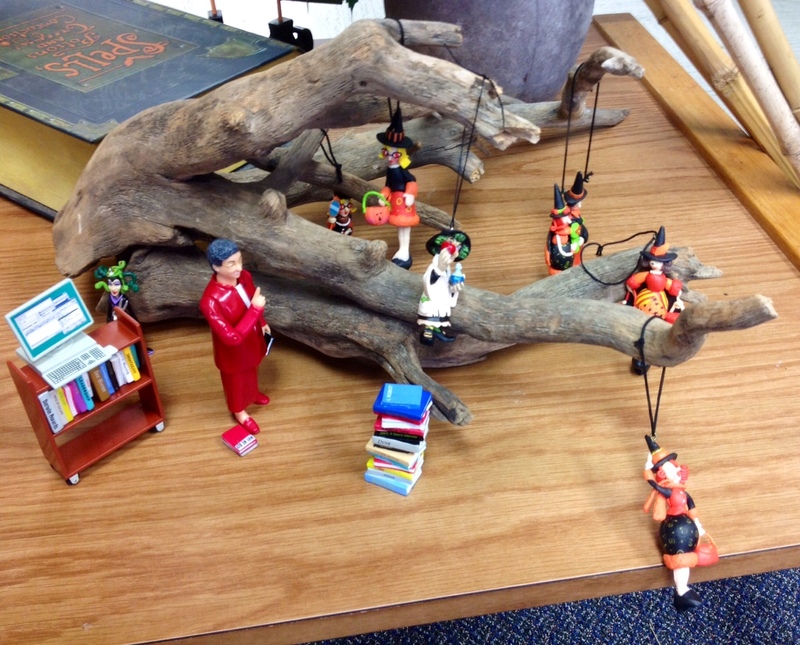 For my department, the librarian action figure emerged from her sabbatical to, as the picture demonstrates, to deliver information to the witchy and wicked. I would share their questions but that would violate their privacy and I would have to turn you into a frog. 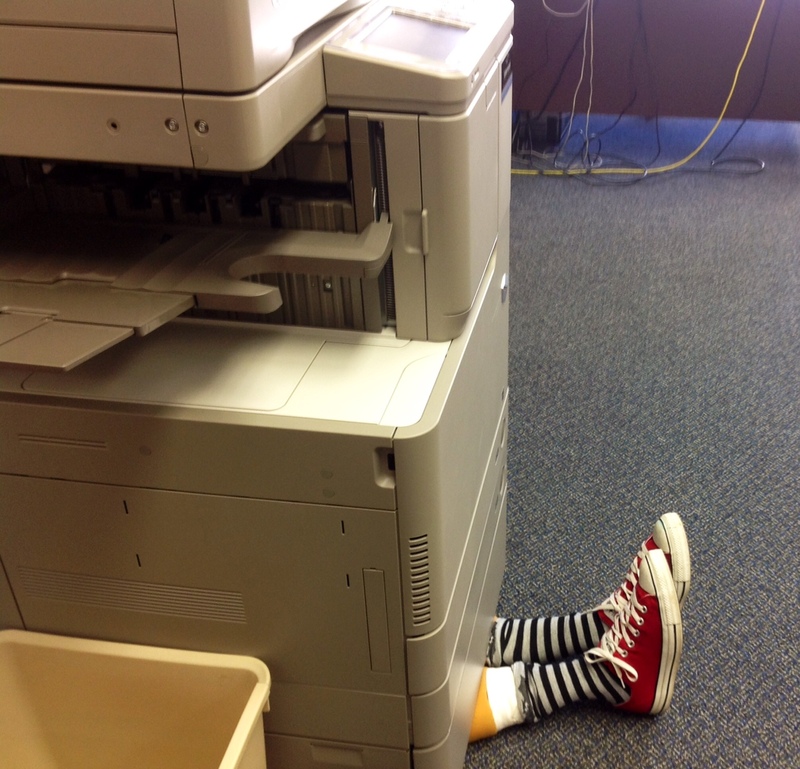 Who needs a house to fall on you when there’s a copy machine. Don’t kill the trees or this could happen to you. Alas, we did not win the contest, but we had a great deal of fun decorating, laughing, and touring other departments. And of course we had a party with lots of good food. Happy Halloween. 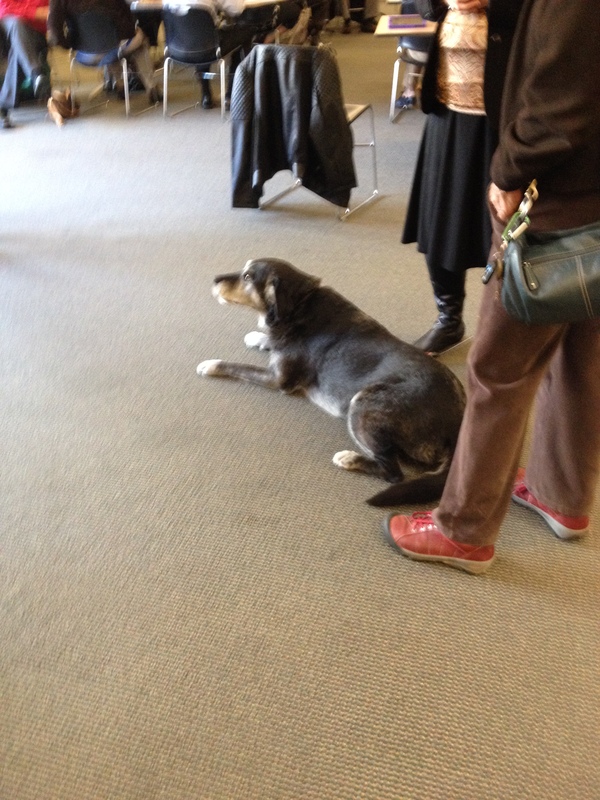 Best Library Meeting Ever…because there were dogs! Last week, I wrote about the South Central Library Council Annual Meeting and the inspiring presentation given by the current President of the American Library Association. As we broke for lunch, part of the program for the second half arrived. Dogs! I mean handlers and their therapy dogs. Immediately, the room became convivial and a lot of people, including me, forgot about lunch and headed straight for the dogs. The second half of the program was led by Tina Winstead, the program coordinator for the Healthy Libraries, Healthy Communities grant from National Network of Libraries of Medicine, Mid-Atlantic region. The six month grant was aimed at educate and encourage libraries about healthy lifestyles in order to encourage programs aimed at their communities. The program consisted of kick-off events, participation (and competition) in The Active for Life program sponsored by the American Cancer Society. There was online book discussions and webinairs. This meeting was the culminating event of the grant. 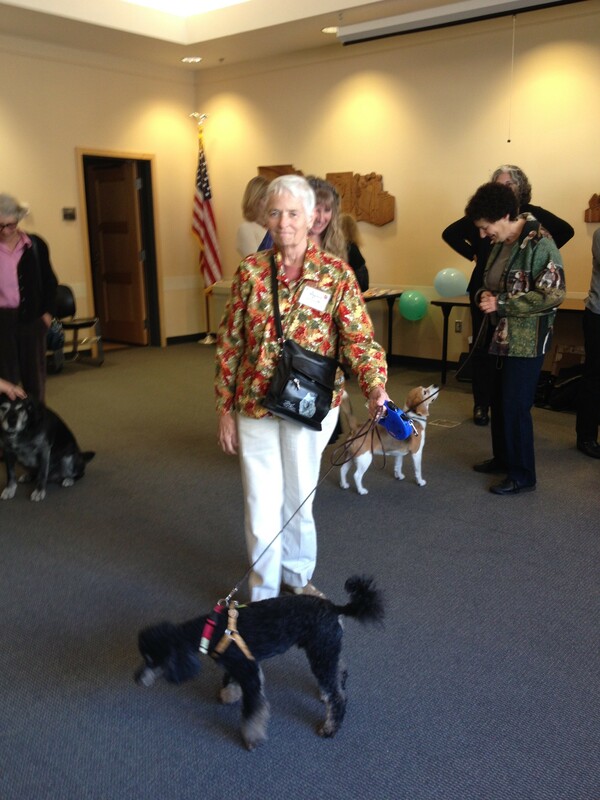 Dr. Sandra Barker, Director for the Center of Human and Animal Interaction (Chai) spoke about the activities of the Center and the health benefits of interactions with animals. Any woman who can name her center after my favorite tea blend and loves animals (did you notice her last name?!) has got to be interesting and savvy. The Center is attached to a VCU’s medical center and the Department of Psychiatry. Her talk, “The Human-Animal Bond and Health: Implications for Healthy Libraries, Heathy Communities. 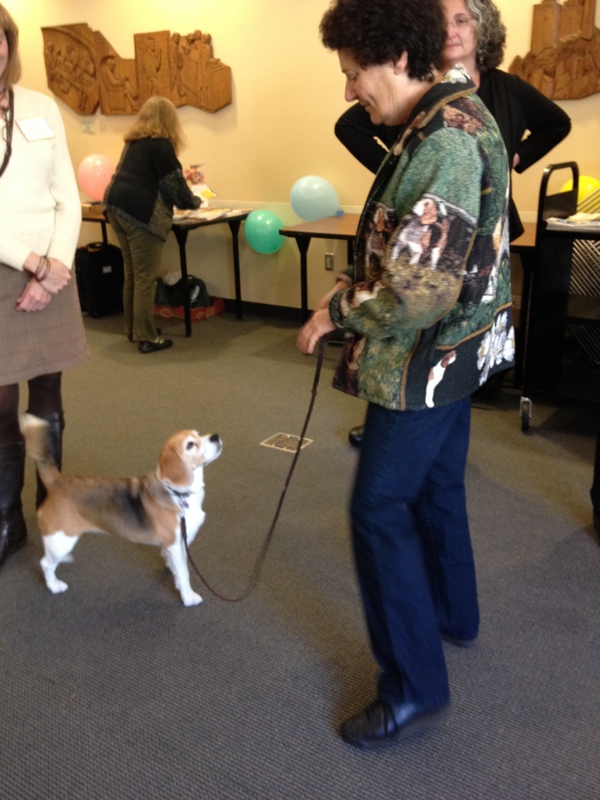 The “Dogs on Call” program supports the research studies as well as the therapy at the medical school. The dogs, adult only, must pass rigorous requirements including grooming and nail-cutting within 24 hours of each visit. They must pass the Medical Center Volunteer training — and by they, I mean the dogs and the handlers — and they must register with one of two external programs: Pet Partner’s Program or Therapy Dogs Inc. In addition, they must complete Chai’s Dogs on Call training program. It’s a lot of work just to get in the door! The program has few restrictions on who the dog can visit and is careful about allergies and people who are afraid of animals. Physicians must approve visits for people with infectious diseases, open wounds, IV, and emergency areas. The dogs don’t visit the cafeteria, probably to their great disappointment. Patients with a history of violence are also not visited. The Center had done many studies with psychiatric students, with children who have cancer and other difficult diseases, and they have also studies the stress relieving benefits. These interactions do support the notion that interactions with companion animals are of a benefit to people, “A consistent relaxation pattern was found among the physiological measures following interactions with dogs [from the distributed PowerPoint handouts]. They have also studied dogs in the workplace –companies that allow their employee to bring dogs. It was a small study but it got picked up by the media so the Center enjoyed a little more than 15 minutes of fame. As Dr. Barker pointed out, more study is needed. The results indicated that the participants scored higher on the indicators of job satisfaction including pay, communication, promotion, benefits, rewards, and operational procedures [paraphrased from the distributed handout]. One of their studies interested me because it dovetails with my college’s Paws for Stress Relief end of the semester programs; our library partnered with PAWS for the Spring 2013 program and plans to continue. The question the Center explored was “Does interacting with dogs really de-stress college students? One of the posters said, “Be calm and Pet a Pooch.” The results indicated that there was a significant difference in stress levels, that 93% experienced a decrease in stress. Overall, the researchers at the Center have found that there are strong physical and mental health benefits for interacting with dogs including reduced mortality, reduced pain perception, increased physical activity, improved cardiovascular function, reduced depression, anxiety, stress, fear, loneliness and increased prosocial behavior, social support, and empathy. The session ended with applause and free apples from a local orchard. I never did get a picture of the golden retriever, the owner and the dog were so popular I couldn’t get a good snap. As someone who used to have a golden retriever mix, I know their sweet and loving personality is always wonderful to be near! A day well spent in a world full of library goodness…and dogs! Two of the best things ever. On Friday October 18th at our regional library council annual meeting, the President of the American Library Association, Barbara Stripling gave an inspiring talk on how libraries change lives. How Libraries Change Lives is the message of her presidency, and as a former school librarian and current library school faculty member, this is a subject near to her heart, as it is to all or most librarians. As part of her presidency, she is urging all citizens to sign the Declaration for the Right to Libraries and to understand that libraries are more than warehouses for books but are also vibrant centers of learning, community conversations, and innovation. She began by saying that changing the world is an enormous and intimidating concept surrounded by trite rhetoric and little action; and to be truly effective, an individual who wishes to change the world endeavors to have an impact on the lives of others, one life at a time! We don’t alway hear about the impact we have on others but as we live, work, play, and learn we need to have faith (my word not hers) that our impact may be felt in small or large ways. When we empower individual voices to speak and to sing, we change lives. Libraries empower the Individual. Libraries provide places and materials for people to imagine, create, communicate, discover, achieve, and develop qualities such as perseverance, self-confidence, and grit (I especially like that one). Stripling said it’s hard to develop grit by yourself. It’s sort of the other side of the growth of a pearl. You can’t become a pearl without the presence of the grit to rub up against. Libraries support literacy and learning. In our environment, there are new literacies, social responsibility, and technologies in which to the individual needs to become fluent. Libraries strengthen families and promote intergenerational conversations and interactions. Libraries are great equalizers in terms of class, income, and status. The second level of the digital divide, with the first being access, is the lack of skills in using the technology. Libraries protect our right to know. Libraries provide access to materials that study all sides of an issue, popular, unpopular, acceptable, and unthinkable. 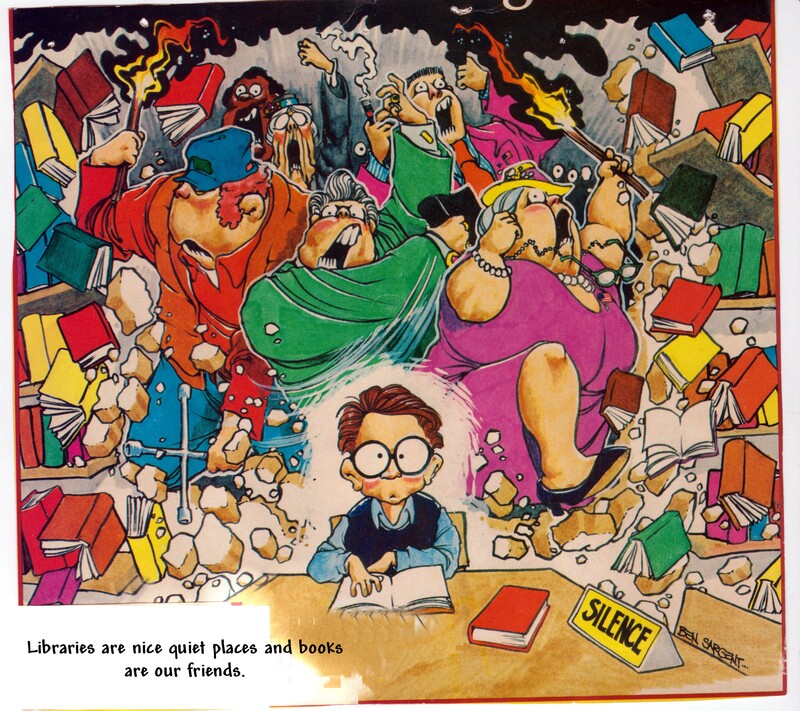 Libraries and librarians make us think about our privacy, and social responsibilities. Libraries strengthen our nation. Libraries are democratic in their conception and hold a special place in our history and the building of the nation. Libraries preserve our cultural heritage. Libraries help us understand each other better. We can develop greater empathy and understanding of how we see each other. In an era where libraries are threatened, defunded, and questioned, it’s important to be able to articulate and communicate the importance of this ideal and the reality. We do have the right to our libraries whether we read fiction, study for our classes, research a new invention, or learn to read and survive in our world. The world of information is changing but the need for knowledge and wisdom is eternal. 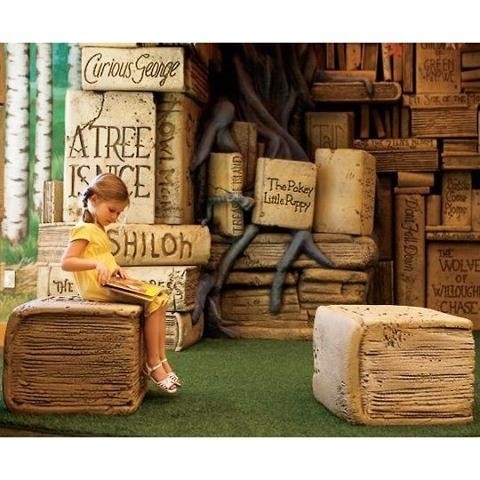 Your library is the place to seek and create. Sign the declaration , host an event, and/or use your local library. Chocolate is better than libraries…except the library won’t give you pimples, expand your waistline, cost you money, or go straight to your hips. So maybe libraries are even better than chocolate….and you have to admit that is really good! It is the first day of spring break and I am staffing the reference desk this afternoon. It is believable, today, that libraries are nice quiet places. All I see is chairs, desks, and cubicles waiting for students to park their bottoms in order to study alone or study together. All I hear is the annoying hum of the printing station and people walking through to their offices. It would be easy to jump to the conclusion that the 21st century academic library is still a nice quiet place with librarians on hand, just waiting to shush help you! That is far from the case here most days. There is a tumult of activity for the students, faculty, and community using the library and for the staff. In our library, we have other campus offices, a very busy and wonderful cafe, computer labs, multimedia labs and a merged technology help center and library circulation desk. The first place anyone goes for help on campus is the library — in the ideal — as evidenced by the noise, traffic, and activity. People come to us angry, lost, fearful, happy, exuberant, and full of trepidation. They may be studying together or seeking a quiet place. They may need something or just want to be alone. We try to provide it all. The assumption and stereotype remain that libraries are bastions of scholarly quiet and intensity. They are but libraries are also more. In particular, public libraries most often experience, first-hand, the charms and ills of a free society. Libraries with their warmth, openness, and free access to information and computers attract people seeking a place to sit, sleep, and learn. Often times, people will leave their responsibilities in the library. From babysitting their children to guardians looking for a place to put a special needs adult, librarians are often surprised (unpleasantly) by the things/people left in the library. Libraries are not exempt from the ills of our society, though in our imagination we would like to dream of them of a place of soulful retreat. Academic libraries tend to be more insulated that public libraries but in my experiences we’ve had more than our fair share of dealing with crime, criminals, the mentally ill, the scary, the quirky, and the weird. Sometimes it’s a fraternity bet (“Go pee in a library trashcan) to a transgendered person denied her right to use the lady’s room. There is some dissonance, this difference between our romantic dreams and the varying reality of libraries. As an insider, it is both fun and irritating to encounter the stereotypes and assumptions about my work and my profession. By the same token, it is a great profession with where change is embraced and the past is preserved. If you think you are confused, those of us in libraries are also confused. Where did the picture come from? I am not sure. I’ve had it since the 1980s when my job was to go through old magazines and newspapers for the ephemeral file. It’s the cover of a magazine, I think The Atlantic Monthly. I couldn’t find a citation or reference to it after a rather cursory google search. I thought at the time (and still do) it was a perfect picture to convey the difference between expectation and reality of day to day working and living la vida library! Winter has gone on long enough, but Mother Nature has other ideas. For those of us who have worked in libraries long enough, we know that we are a community of workers serving a community of users; and sometimes we get on each others nerves. We also have to work with other agencies and other organizations to make our work functional. A few years ago, there were some stringent budget cuts from the state and the word came down that we could not pay for catering at our public events. The Friends of the Library was putting on a program and we know food is an important part of programming. We decided that the library faculty and staff would provide the food for the event and noted that in our promotional fliers and emails. This elicited a phone call to the librarian organizing the program from the head of dining services. He stated that the food must be prepared in a kitchen inspected and approved by the Health Department…. or all food must be wrapped and served with tongs. In describing this phone call, the librarian said, very frustrated, “We might as well serve Little Debbie cakes!” Luckily, some organizational powers-that-be intervened and the event had food provided by dining services. But another idea was born. The library’s social planning committee puts on an annual “Blahs Party” during Spring break (early March) and we had a Little Debbie party, partly in honor of the librarian in charge of the event. The event had a variety of Little Debbie’s, a poetry reading, and, of course, tongs. 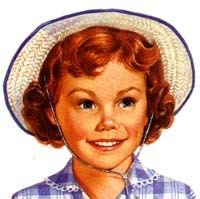 By coincidence [not], it was the 50th anniversary of Little Debbie. When that librarian retired last year, part of her gift included boxes of Little Debbies and tongs. And here in honor of shaking away the blues away …..
We are cold inside when the wind blows. And gives us honest pleasure without guile! Distract us from our library busy-ness. We now have a party that can’t be beat. This party sure is a honey. Huzzah and Hooray for our fun, health, and wealth!!!! Yes, the primary “soft” skill set needed to be a librarian is creativity, adaptability and flexibility. Libraries have always innovated and people have always had a range of reactions to it. Libraries are a community of workers serving a community of users; and those communities bring their strengths, weaknesses, joys, and ills with them. They do not get left at the door when people come inside. They act out, suppress, let loose, and sit down with all their history and future. Our job is to help them find the resources they need to cope with those histories and help them find ways to walk into their future. 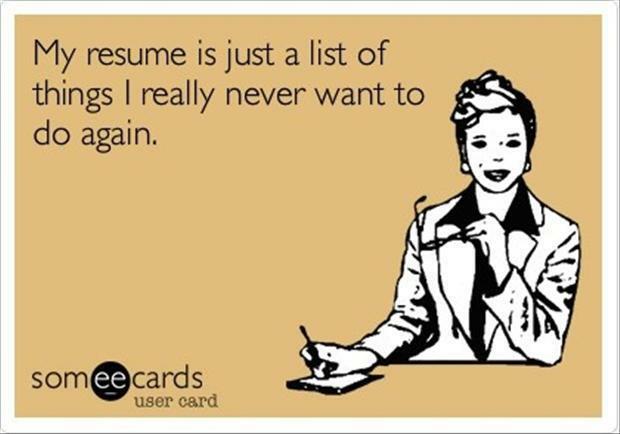 It may be entertainment, health information, legal information, or some information they need to get by. There’s also a mystique and romance about libraries that most people have and expect to be acted out for them when they enter the library. People become disappointed when they come to the library and expect whatever they expect and don’t get it. They may expect a nice, quiet place and find that the library is full of lively students studying and talking together. That there’s food, and coffee, and the gentle hum of computers, printers, and cell phones. Or that they expect instant answers to all their questions, only to find that there’s a process and perhaps a waiting period. And through all that tumult of expectations and reaction, the librarian helps people manage their expectations and their research needs. It’s a juggling act. Working in a library often strips away the mystique and romance of a library. We know so much about the inner workings of a library, the pain and suffering that goes into making things a simple as possible for the user, and our own inability to get out of our own way that we lose sight of why we wanted to be a librarian in the first place. Most of all, I hope the reverse bucket list will restore and revitalize my vision of the library as one of the things in our society that truly envisions and embodies the democratic ideal of freedom of thought, the pursuit of knowledge, and the right to read and reflect on knowledge without censure, judgment, or comment. Libraries are the place where your rights as a reader and pursuer of knowledge are passionately defended and your tastes and needs are met regardless of what others might think of the format or the content. 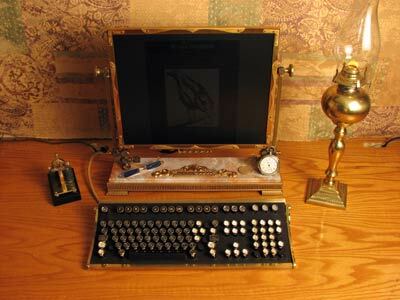 Steampunk is very chic and stylish these days. It’s actually been around for a while as a subgenre of science fiction. It has started to make its way into the mainstream through movies, tv shows, and fashion. Many people don’t know that what they are looking at when they watch Warehouse 13 or Alice in Wonderland is that they are looking at some Steampunk vision. Steampunk is a genre of science fiction that has its roots in the work of Jules Verne and others. The early adventure penny novels in the U.S., evoking entertainment, and gadget-based solutions or rescue are early precursers to the genre. The steampunk universe is one of the infernal machine, where the clockwork universe lies uneasily between the pseudo-Victorian mindset and the speculations of the infernal machine, gadgetry and progress. The philosophy in the early days of the genre was cynical and rebellious, rarely offering solutions to the problems it portrayed. There’s no denying the steampunk look is stylish, idiosyncratic, and funky. It evokes bygone days, gaslight romance, and adventure. 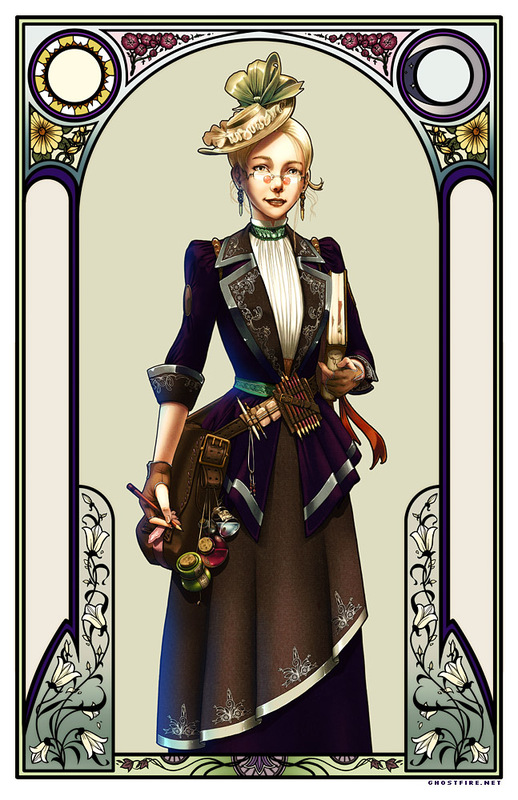 So why a steampunk librarian. Do I wear the look? I wish. It’s because the present day college library operates in the borderlands between the 19th century foundational ideals (and sometimes buildings) and the 21st century gadgetry, technology, whiz-bang stuff. It’s all changing and it’s all changing us. And yet there are things that remain the same. What remains is an individual, idiosyncratic look of how information changes us and how we learn and grow wise from it. Libraries tend to be in the center of this maelstrom of iconic traditional vision and current change and transformation. We’ve been punked. It is an exciting time to be in the information biz.